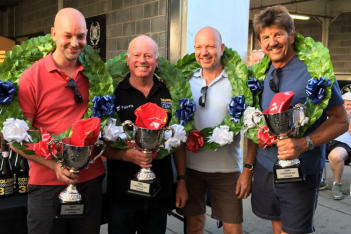 SPA 6 HOURS - September 2012 The MG Motorsport Team photo taken by Chef d’Equipe Doug Smith, with Tom, John, Tony and Keith with co-driver Dave “Fastest Moustache in Derbyshire” Beresford in car. 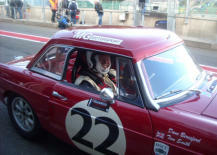 Qualified 42nd out of 103 in 3:04.871, quickest MGB. Finished the race in 18th overall (excluding the Eau Rouge racers) and first B home with vibration all the way but no other problems despite being biffed by a blind Falcon driver. 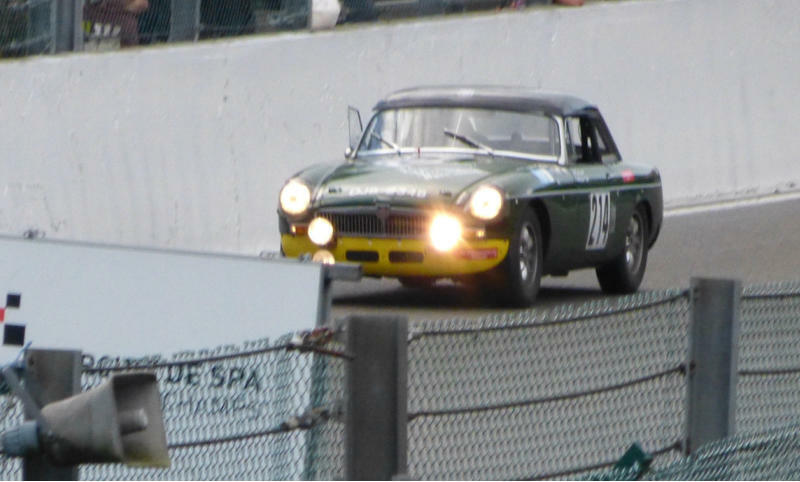 No safety car periods and no rain - extraordinary. Good company on the pit box with Sjoerd Peereboom and his gang from Holland who finished 38th. We may have to supply the beer next year. 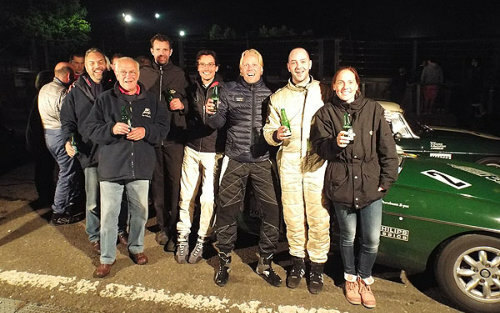 SPA 6 HOURS - September 2013 This year we were invited to join the Dutch Team - Scuderia Testicoli di Cavallino - led by Sjoerd Peereboom, with Jasper Izaks, and Tom, ably spannered by Marco van Laar. Keith Allen was the Chef d’Horlorge, whilst Doug was Chef d’Equipe as usual (a very important position). We qualified 66th and finished the race in 25th overall with no problems except loosing about 10 minute in long re-fueling stops. No rain and a good time had by all. 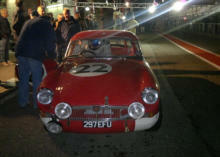 We were the 2nd MGB home, beaten by the Harris, Wheeler, McCarthy team sharing our pit. 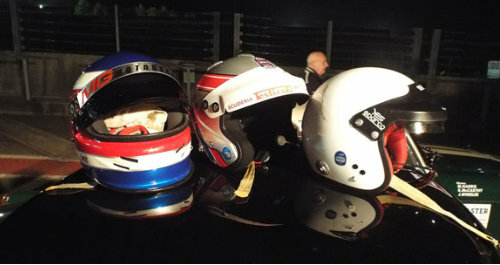 The photo shows their unfair advantage. 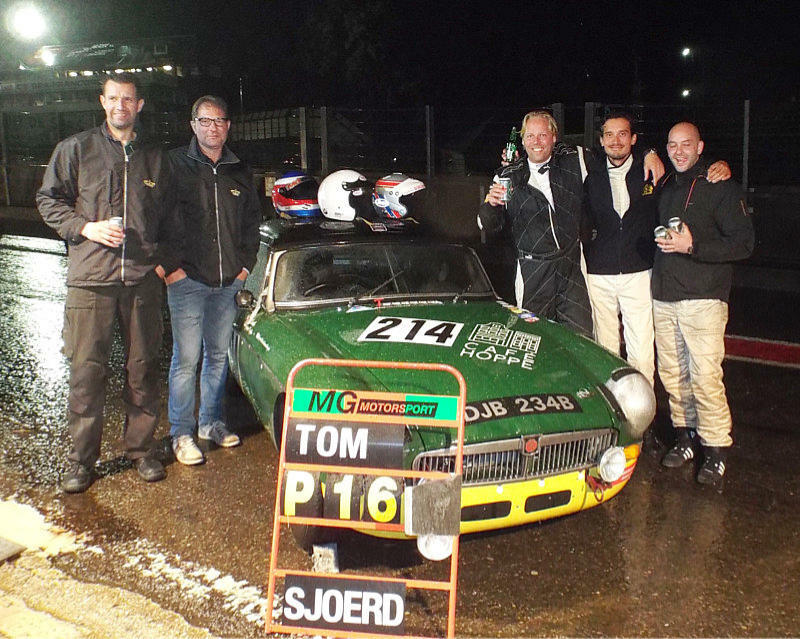 As last year, Tom drove with the car’s owner, Sjoerd Peereboom and Jasper Izaks, with the car builder, Marco van Laar spannering, Keith Allen timing & board and of course myself as Chef d’Equipe. 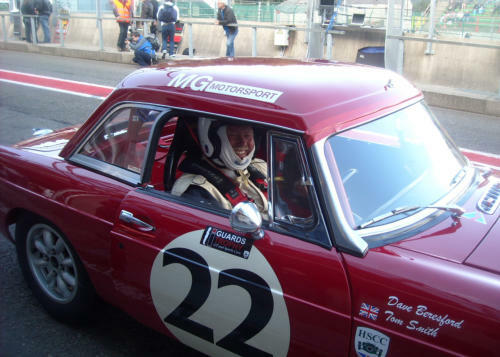 The boys qualified 64th and finished an excellent 16th overall in a race dominated by safety cars and later torrential rain. 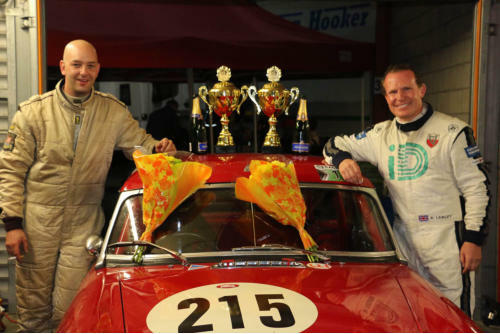 Considering the entry included no less than 10 GT40s, Cobras and E Types, a total of 110 starters, a superb result! 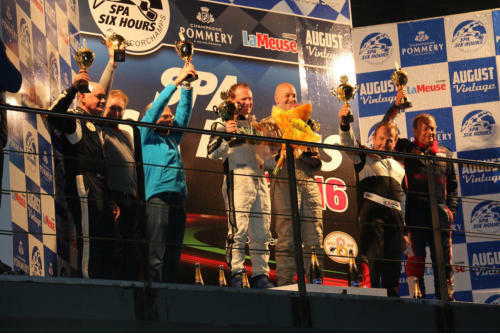 SPA 6 HOURS - September 2015 Better than last year! 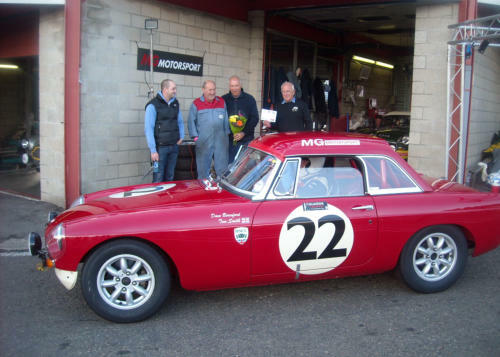 13th overall with the same team - Owner Sjoed, Jasper, and Tom, with Marco Van Laar car builder and his wife Gerda. Keith on the wall timekeeping and Doug as the redundant team leader! 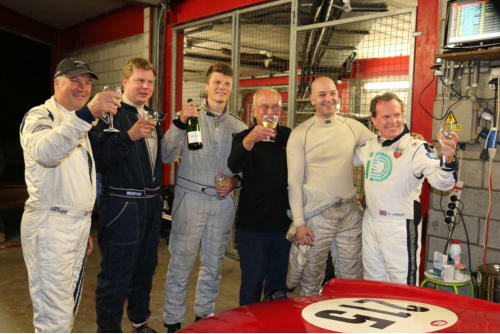 Morleys - Clive, James, Stuart, celebrating a clear run on their first Spa 6 Hours in an MG Motorsport MGB, to finish 2nd MGB home, 7th in class and 38th overall. They will be back! 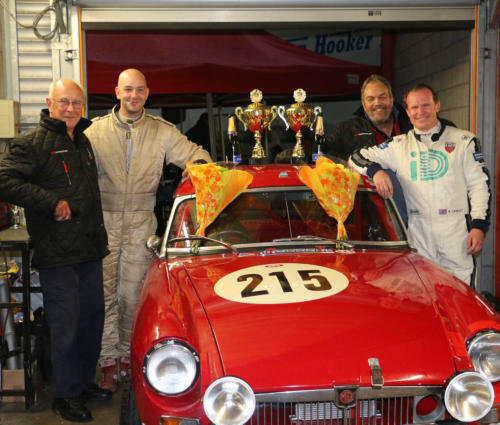 Tom Smith and Andrew Lawley win GTS11 and 19th overall in the MG Motorsport 1963 MGB FIA Racer. Once more the MGB has punched well above its weight to win its class and beat much more powerful opposition. 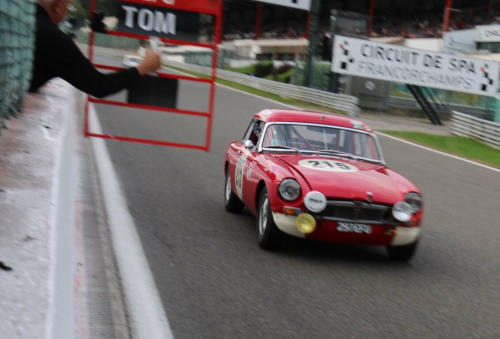 In doing so Tom chalked up his 100th race win. 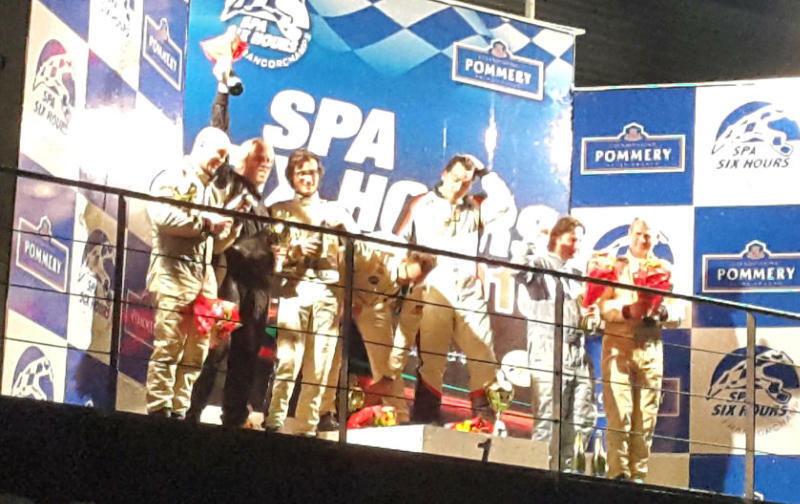 A slight ding curtailed qualifying, resulting in a 68th grid position, but in the race with Andrew at the helm for the rolling start with a full tank, 3 driver changes and one fuel stop later, they finished on the top step of the podium.